My great secret is that I'm not a native San Franciscan. My parents made a go of living in Santa Rosa when I was born, and although they soon moved back, I've never forgiven them. A native San Franciscan is a rare thing in this city of transplants, so I was excited to hear of one in Golden Gate Park. Greg Gaar told me that before Laurel Hill Cemetery was paved over in the 1940s, a unique native manzanita was moved from there to the Strybing Arboretum. I choose a brilliant autumn day for the hunt. My search for a true native takes place in the land of the expatriated: ferns from South America, maple trees from Asia, heather from Africa. The Strybing Arboretum has tens of thousands of species of plants from around the world. I decide that just browsing around the 55 acres looking for manzanitas is not the best use of my time. Luckily the Helen Crocker Russell Library of Horticulture sits just inside the main entrance. On my way in for some help I pass perhaps the most exotic resident of the arboretum. The patio outside the library is made of rough, ancient stones artfully arranged with a low wall around a number of benches. It's an inviting space for meditation or prayers, and either would be entirely appropriate since the stones once made up the walls of a medieval monastery. Santa Maria de Ovila abbey, built by Cistercian monks beginning in 1188, stood in central Spain for over 700 years. In 1930, William Randolph Hearst, the newspaper tycoon, bought it. Hearst had the monastery and its various outbuildings taken apart stone by stone to be shipped and rebuilt as a personal retreat in Northern California. Financial reverses during the Depression forced Hearst to abandon his plan halfway through. The stones, each carefully identified for reconstruction, sat in storage until they were eventually given to the city of San Francisco in 1941 as a "gift" (some accounts insinuate Hearst was bailed out by friends in city government, and the city did end up paying $25,000 in back storage fees). The grand entryway of the abbey found its way safely into the De Young collection, but for decades most of the stones sat in crates in a corner of Golden Gate Park. Periodic proposals for reassembling were kicked around to no avail, while park employees used pieces of the abbey for decorative landscaping. Eventually the identifications wore away and the puzzle became, in practical terms, unsolvable. In 1994, the Fine Arts Museums of San Francisco gave a large number of blocks to an order of Cistercian monks in Vina, California. They are still working to rebuild the old chapter house, matching pieces by caliper, intuition, and educated guesswork. 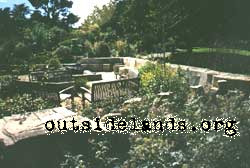 The remainder of the stones has found new life as this restful terrace. A helpful librarian, using five books and a phone consultation, pinned down my manzanita in a corner of the California section. A short walk brought me to "Arctostaphylos hookeri, subspecies franciscana", a scrubby, thin-twigged bush, riddled with the webs of miniature spiders. It's the kind of plant that a homeowner might casually rip out to plant tomatoes. Well, who says the natives have to be as glamorous as the newcomers? Read more on the monastery stones (with a 2006 update). Image credits: "Arctostaphylos hookeri, subspecies franciscana", patio of the Helen Crocker Russell Library of Horticulture. WNP photographs, September 2001. 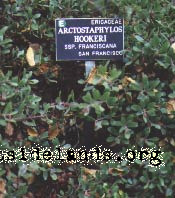 Bibliography: San Francisco's Golden Gate Park, Christopher Pollock, 2001; The Independent, May 15, 2001; San Francisco Chronicle, August 22, 2000; Information sign beside the patio in the Strybing Arboretum.